Thanks to the earlier remake of Superstar Saga, it was already possible to play every Mario and Luigi game on the 3DS. Alphadream nevertheless went ahead and remade the third game in the series as Mario and Luigi: Bowser’s Inside Story + Bowser Jr.’s Journey, and it provides an excellent opportunity to catch up for those who didn’t experience this entertaining title on the DS. The original title is pretty much the same enjoyable ride, and Bowser Junior gets to take the spotlight for an equally fun additional section. Anyone who hasn’t been engaged by prior entries won’t be converted here, but Mario and Luigi fans have no reason not to investigate. The Mushroom Kingdom is undergoing a crisis known as the Blorbs, in which many of its fungal inhabitants are mysteriously bloated to incredible proportions and rendered immobile. Into this dilemma wanders Bowser, on his usual quest to make off with Princess Peach and take over the Mushroom Kingdom. Mario and Luigi are interrupted from performing their usual duties by the sinister Fawful’s plan, which causes Bowser to uncontrollably inhale most of those resident in the Mushroom Palace. The plumber brothers have no choice but to explore Bowser’s body while they’re stuck inside, and the Koopa King himself is unpleasantly greeted by Fawful’s own scheme to conquer the land. Their motivations don’t come anywhere close to matching, but the brothers and Bowser are both against letting the bizarrely nefarious Fawful reign supreme. Mario titles are not known for their groundbreakingly insightful narratives, and Bowser’s Inside Story does not buck that trend. Instead it provides an amusing tale sporting numerous entertaining character interactions that are well-rendered through Nintendo of America’s witty localization. A sense of humor and wit keeps things progressing lightly, especially since Fawful is not among the most intimidating adversaries ever depicted in the annals of fiction. Anyone coming to Bowser’s Inside Story for a sober analysis of anything will be sorely disappointed, but as a goofy lark it’s an unquestionable success. The localization also does an excellent job of making NPCs stand out through bizarre speech patterns that avoid becoming annoying. Astoundingly, the word ‘excellent’ did not come out of Bowser’s mouth. Combat with Mario and Luigi is similar to that seen in other installments of the series, with visible enemies that can be damaged at the start if the brothers initiate contact correctly. All of their standard attacks and special Brothers abilities depend upon properly timed button presses to be most effective, and many techniques will fizzle altogether without a good eye. Reaction time also matters immensely when enemies are on the offensive, as it is theoretically possible to avoid every strike ever launched. In practice, it takes some familiarization with regular foes to successfully dodge their onslaughts, and boss attack patterns are much more complex. Initiating the actions may be turn-based, but without good reaction timing the player will not get very far. Bowser controls similarly to the Mario Brothers, though he punches and breathes fire instead of having abilities associated with the plumbers. His special abilities are unlocked by freeing various types of minions from imprisonment, at which point they renew vows of fealty to the Koopa King and offer services as assistance in combat. Just like Mario and Luigi, it is theoretically possible to avoid everything that comes toward Bowser, though a great deal of practice will be necessary to actually achieve this. Bosses in particular are fond of long attack patterns in which one player error with timing will be compounded via multiple hits that can make Bowser drop incredibly fast. A nifty function to link the protagonists comes from encounters in which Bowser can inhale certain adversaries that must then be defeated by Mario and Luigi inside his body, something that needs to be done in numerous boss fights. Something that’s changed from the original version of the game is the ability to enter Easy mode, which is one of the options upon meeting defeat. Easy mode can be turned off whenever the player wishes, and makes a significant difference in how much damage the player gives and receives. Easy mode isn’t tantamount to making enemies pushovers though, as they still have enough strength to punish carelessness. A separate Easy option applies to the special moves of both the brothers and Bowser, making their input more forgiving. Sea urchins are good targets for Hammer Brothers. This revelatory news will change the world. 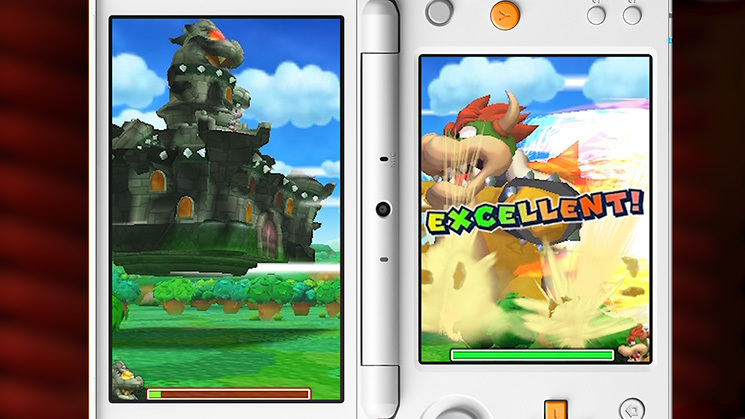 Bowser’s Inside Story introduced giant battles, seen using a different rendition later in Mario and Luigi: Dream Team. These play out by having Bowser grow to the size of a Kaiju and be controlled through the touch screen, doing battle against opponents of a similar size. As a change of pace they’re great fun, and are a source of entertaining spectacle that isn’t overused. One fortunate alteration from the original Bowser’s Inside Story is the removal of mandatory microphone use to power Bowser’s fire attacks, a function that has been moved to the more forgiving touch screen. Exploration of the world is made interesting due to the presence of areas mutually exclusive to the Mario Brothers and Bowser, thanks to some field techniques that are learned gradually. Shortcuts abound to cut down on time spent backtracking once a new ability is learned, and the interface is efficient at conveying the necessary commands. This 3DS incarnation adds a Gauntlet zone as an option for testing the player’s skills, just in case the numerous optional bits already in the game weren’t sufficient to motivate exploration. 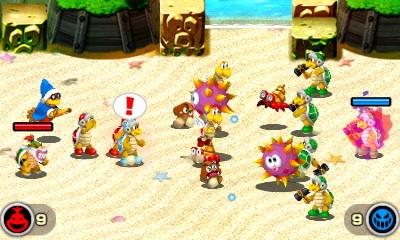 Bowser Jr.’s Journey is the main addition for 3DS, and its parallel narrative shows how Bowser’s son and the Koopalings have to cope with events while Fawful carries out his schemes. Bowser Junior has to deal with the trio of Best Fitness Friends, antagonists exclusive to this content. This narrative is filled with amusing moments that showcase personalities not seen in the original title, but it also manages to flesh out Bowser Junior’s character a bit more than has been seen before. It’s a thoroughly rewarding addition to the overall game. Actually playing through the journey is very similar to the quest of the Minions that was added to the 3DS remake of Mario and Luigi: Superstar Saga, taking the form of a light real-time strategy title. Bowser Junior is the leader of various troop combinations numbering up to nine. These troops go forth and battle against their foes with AI, and aside from techniques accessed from the touch screen and critical strikes by the soldiers, fights proceed automatically. Using the right type of troops is critical for success since a great range of affinities guide how well the combat goes, although leveling up is also critical for increasing the soldiers’ survivability. This is not a particularly deep combat system, but it is entertaining and features just enough player input to keep things from feeling totally automatic. Proving that there are indeed limits, Mario and Luigi will not go underneath a giant Toad with the Blorbs. Yoko Shimomura is a consistently strong composer for this series, and her work is once again an effective mix of moods that perfectly suit the Mushroom Kingdom’s environs. Several compositions are heard only in Bowser Junior’s tale, and are equally energizing. Sound cues are just as helpful in guiding correct timing as the visual information while using special techniques, and do a fine job at the task. Nintendo’s usual standards are also upheld in the graphical aspects, which do not push the 3DS but look consistently interesting in the depiction of a colorful and goofy landscape. Bowser’s innards are an interesting series of places to explore, as is the Mushroom Kingdom. Adversaries also feature a number of intricate animations that are key to success, as each one indicates a certain upcoming action. Some adversaries not seen in the main game appear when going through Bowser Junior’s trek, which is at least a nice way to minimize visual repetition. A lot of time has passed since 2009, and I find it harder to unreservedly gush about games now than then. 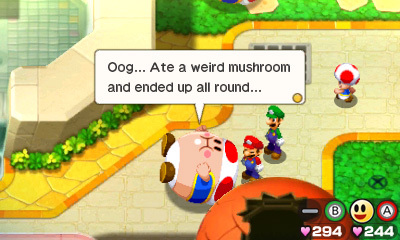 Mario and Luigi: Bowser’s Inside Story was an unexpected delight when I first played it, while now the game is less surprising and more familiar. That doesn’t detract from its quality in any way, and anyone who missed it the first time and has even the slightest inkling of interest should immediately track down a copy. There really hasn’t been an outright bad Mario and Luigi game, but this one lays a worthy claim to being the strongest of all.